A pair of Lady Saints, one used to the attention, and one not quite so much, claimed Jayhawk West Conference awards this week. Freshman Angelina Minor picked up her first Jayhawk West Player of the Week award, splitting the honor with Hutchinson’s Nicole Kinser this week, while sophomore libero Kari Anderson earned her third straight Jayhawk West Defensive Player of the Week award. Minor put together her finest two performances of her college career this week, registering a career high 22 kills against Pratt on Tuesday and backing that up with her second highest kill total of her career with 19 against Cloud County on Thursday. She finished the week averaging 4.56 kills per set and a .280 hitting percentage. 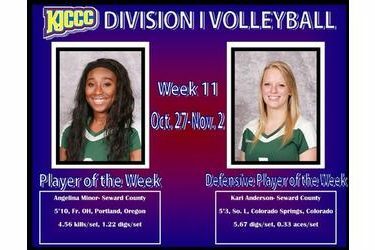 Seward County sophomore Kari Anderson had another big week on the back line for the Lady Saints in a pair of Jayhawk West Conference contests, averaging 5.67 digs per set. Tuesday against Pratt, she had 26 digs in a five set loss in the Beaverdome and on Thursday she had 25 in a Seward win over Cloud County to secure 3rd place for the Lady Saints. Her week pushed her into 1st place in the Jayhawk West in both digs per set and total digs on the season. Seward will open Region VI Tournament play Sunday night at 7:00 in Hutchinson when they take on Butler in the 1st round.